Heard the one about the Irish Strawberry? The Arbutus unedo, known to us as the Irish Strawberry Tree, is native to Mediterranean regions like Portugal and Spain, where it’s called the Madroño tree. However, pollen from the plant dating back to 4000BC has been found in Irish bogs and a native population is also found in those chilly northern climes. The Arbutus crops up in local folklore from around the eighth century, with its Irish name of Caithne or Cain’s Apple. However, in the Mediterranean it is mentioned much earlier, with Pliny cautioning bee-keepers to avoid its use for honey production, owing to a bitter taste. The tendency for the fruit to ferment on the tree made it attractive to humans and animals which, perhaps, is why the coat of arms of Madrid depicts a bear attempting to feed on Arbutus berries. It’s hard to say when the Irish Strawberry first arrived in Australia, although it had long been used as an ornamental tree in Britain. 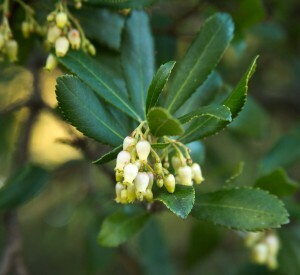 According to the National Arboretum, the first Arbutus unedo seed was brought to Canberra from the railway station garden at Killara, on Sydney’s Northern Line, in 1913, the year of Canberra’s founding. The station was opened in 1899. The Arbutus also featured in my personal history. 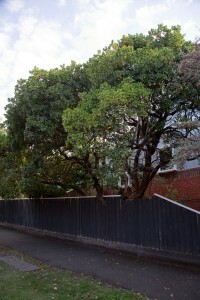 My childhood home in Glen Iris, Melbourne, had a well-established Irish Strawberry tree. My mother called it a Quandong, and impressed on us that its glowing orange and red fruits were poisonous. Wrong on both counts. But it did add a certain spice of danger as we climbed in the tree, perched on a sturdy branch and played tea-parties with the bright berries. But, ever the experimenter, my other half decided to try a little jam-making. The result, after berry collecting, washing, cooking, sieving to get rid of the tiny pips, boiling up with brown sugar and rummaging around in the cupboards for usable jars, was one small pot of orangey-brown paste. The taste? A bit apricot-ish, with a slightly bitter after taste. Edible? Yes, definitely. Appetising? Well, as far as I’m concerned, the jury’s still out.